Welcome to Leisure Lane on this fabulous Tuesday, my friends. I hope you’re enjoying the day. 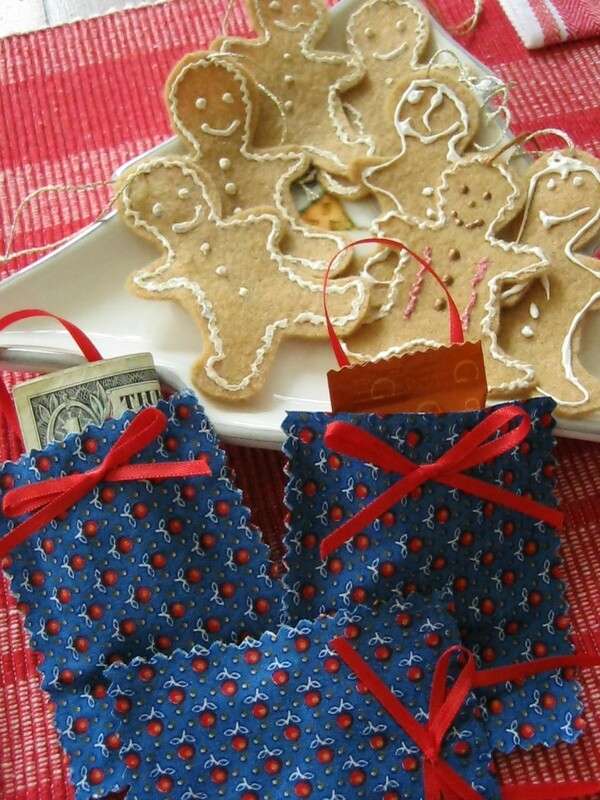 I’d like to share two easy-peasy craft ideas that are perfect to do with children or alone – felt gingerbread men and fabric pouches. Last night, while looking through my container of Christmas decorations, I came across these. I had made them with my son when he was a child, and took them out for nostalgia’s sake and to share with you. So, let’s get started. 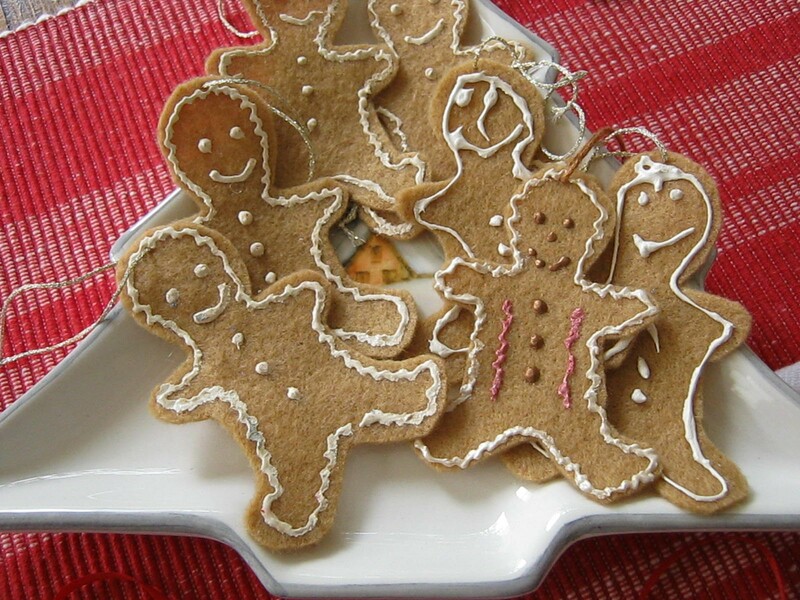 The gingerbread men are so easy to make, you’ll whip up a batch in no time. Lay the felt out on a clean surface. Using the cookie cutter as a guide, place on felt and trace around the edges with a pencil. Repeat throughout the felt just like you were cutting out real cookies from dough. Cut out the designs with your scissors and decorate with paint as desired – just have fun with it. 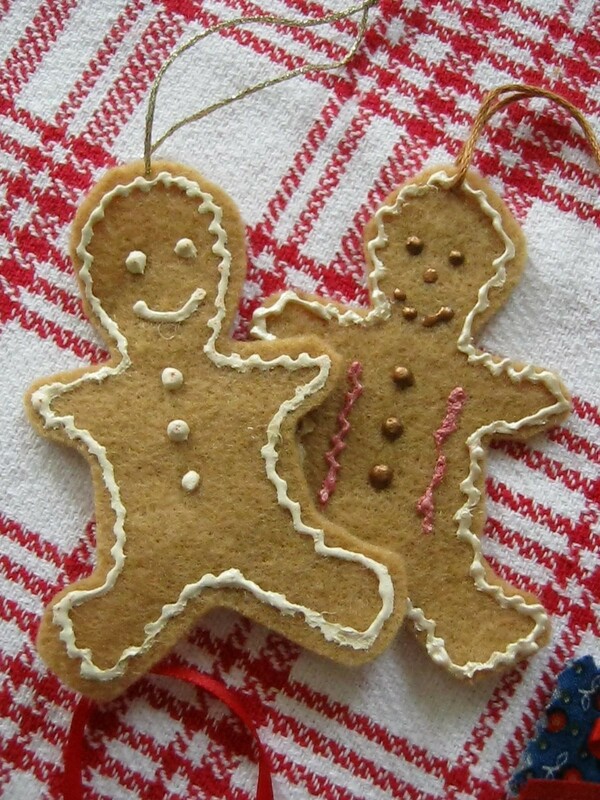 Once the paint is completely dry, if desired, you can thread a needle with some regular or decorative string and make a loop on the top of the cookies for hanging on the tree. They also look yummy arranged on a cookie dish. But don’t leave any milk nearby, or Santa will think they’re for eating ;). These mini gift bags are even easier to make and so pretty. 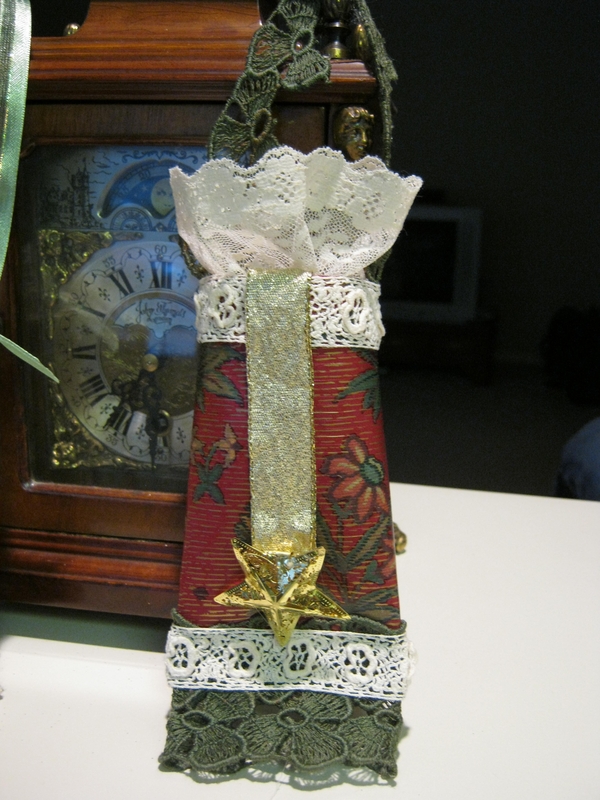 You’ll want to make extra for decorating your packages. With your ruler and paper, mark out a size that you would like. My mini bags are approx. 2 3/4″ h x 3 1/4″ l. Cut out pattern and place on cotton fabric. Using pinking shears cut out fabric shapes. You will need two pieces for each bag (front and back). On wrong side of fabric, glue along sides and bottom. Place wrong sides together and adhere gently with fingers to ensure all sides are secure. You will be leaving an opening at the top. While glue is drying, you can cut out strips of ribbon approx. 4 1/2″ long. These will be for the handle and bow on each bag. Once glue is completely dry, take a piece of ribbon and glue the ends inside and to the back of the bag, as shown above. 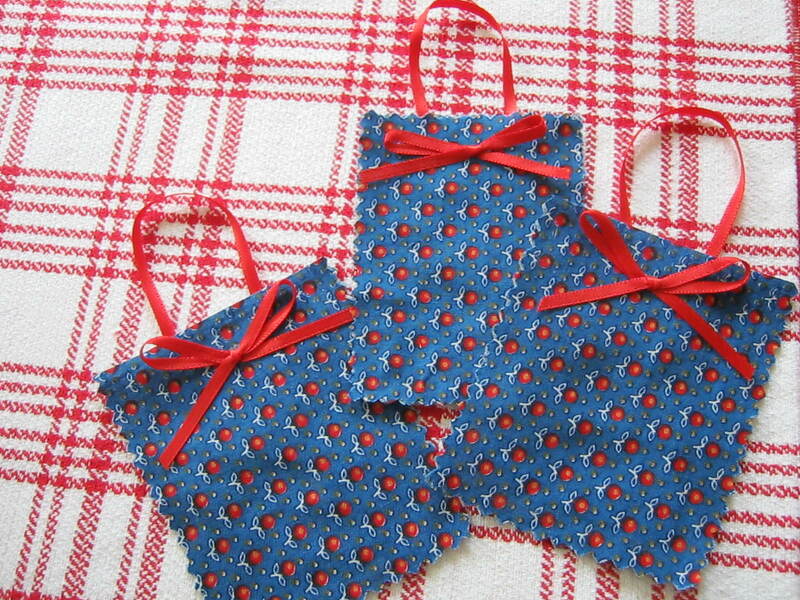 These will be perfect for hanging on the tree or attaching to a package. 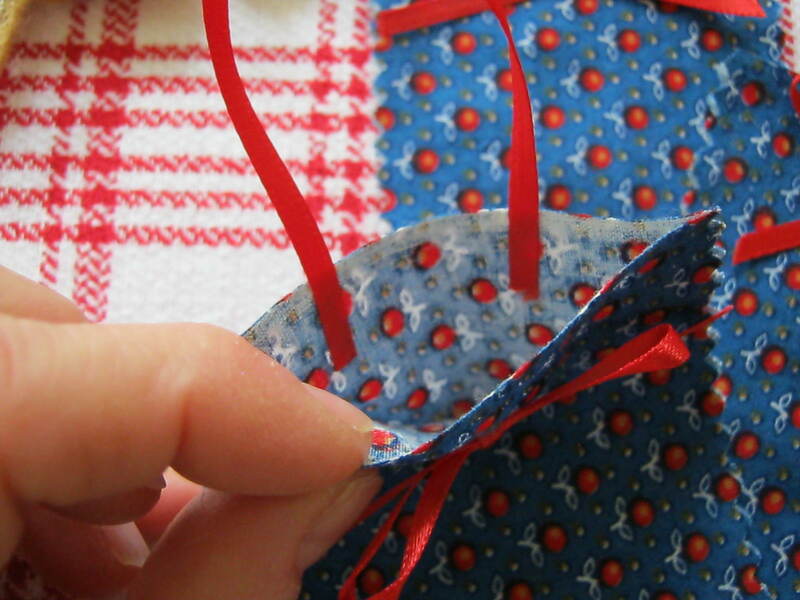 With another piece of ribbon, make a bow and glue to outside front of bag. Let glue completely dry before using the bags. You can stuff them with money, candy, or any little surprise. If you make the bags slightly larger than a gift card, you can add one of those, as well. Have fun, and if you make any of these projects, please share…I’d love to see. If you have any questions, please feel free to ask. Well, that’s all for now, my precious friends. I hope you enjoyed these Christmas crafts. Have a joyful and healthy Christmas, and take some time to breathe and reflect on the true reason for the season. Welcome to Leisure Lane today. I hope you’re all enjoying the day. It’s full of promise – I promise! Today, I’d like to share another Christmas card. 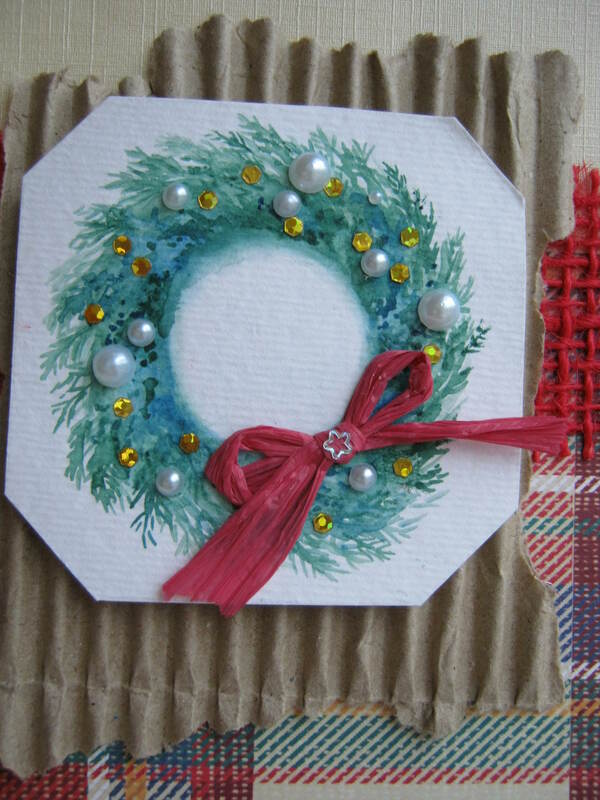 I painted the wreath and decorated it with some craft stick-on “pearls” and some cute gold flecks. The flecks were from a package I bought at the dollar store in the cosmetics department. They’re for finger nail decor and the package came with different colors and shapes, like iridescent and silver stars, green circles, etc. So, next time you’re in the cosmetic section, look around – you may be surprised to find things you can use for craft projects. Finished off the wreath with a raffia red bow and added one of those silver star flecks to its center. I used the corrugated cardboard as is; I think it adds something nice in its raw state. Thank you for strolling by today. 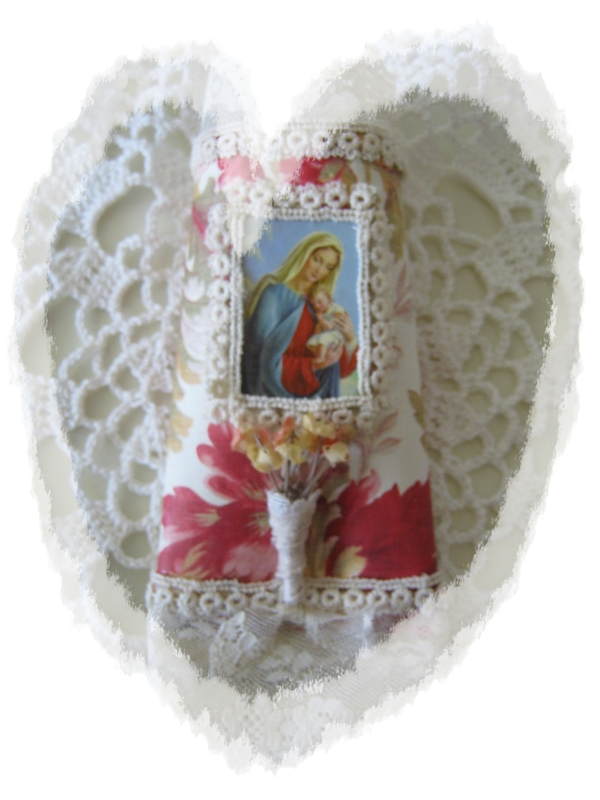 I hope you’re inspired to do something fun to decorate your home or give as a gift. 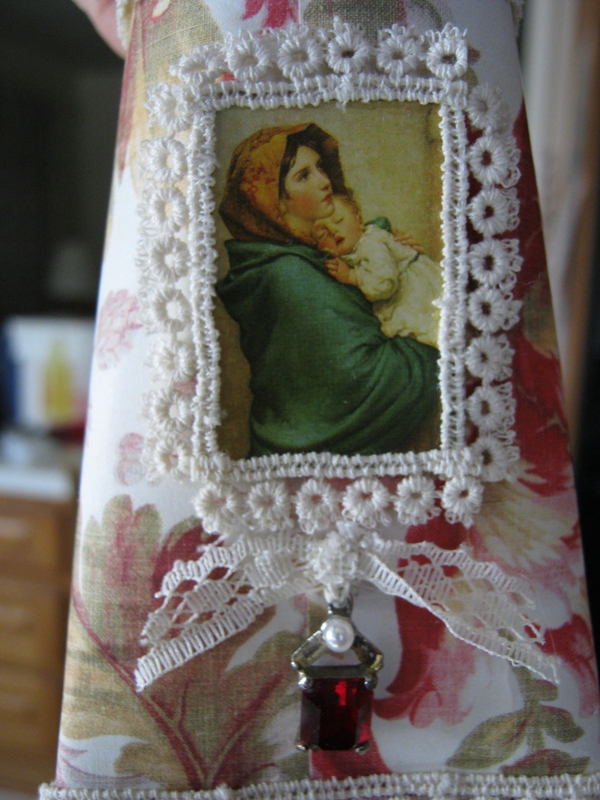 In the following two Christmas hangers I used some beautiful scrap book paper I had stored away. It was perfect for these. At the Dollar Tree I found sheets of stickers portraying Mary and the baby, Jesus, and I had to use them for this project. I think I’d love to do a framed version of these. As I was making these they began to take form on their own. As if they knew exactly what they wanted to look like. Isn’t the paper lovely? 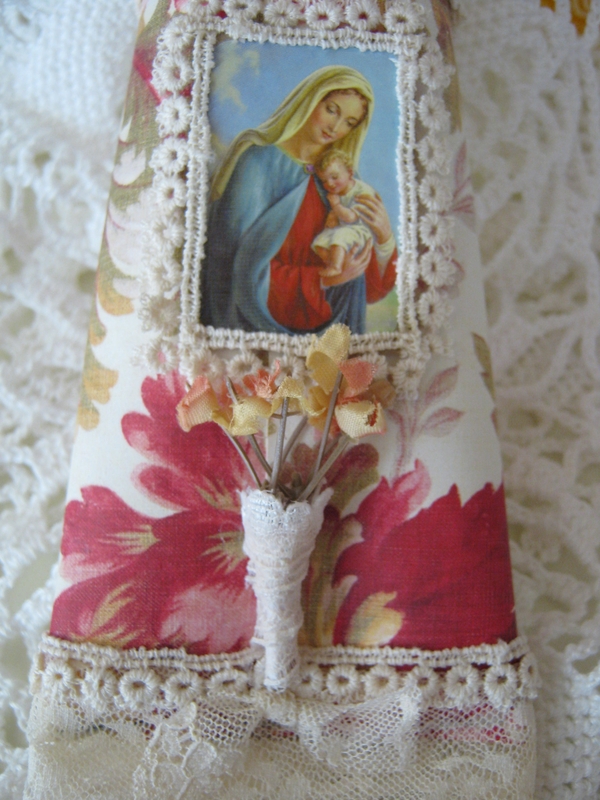 After I framed the picture of Mary and Jesus, I got the idea to create a little cone for a vase with flowers. It worked very well for this hanger. I made a bow with a tiny piece of left over lace, and that added a nice touch. Nothing goes to waste. 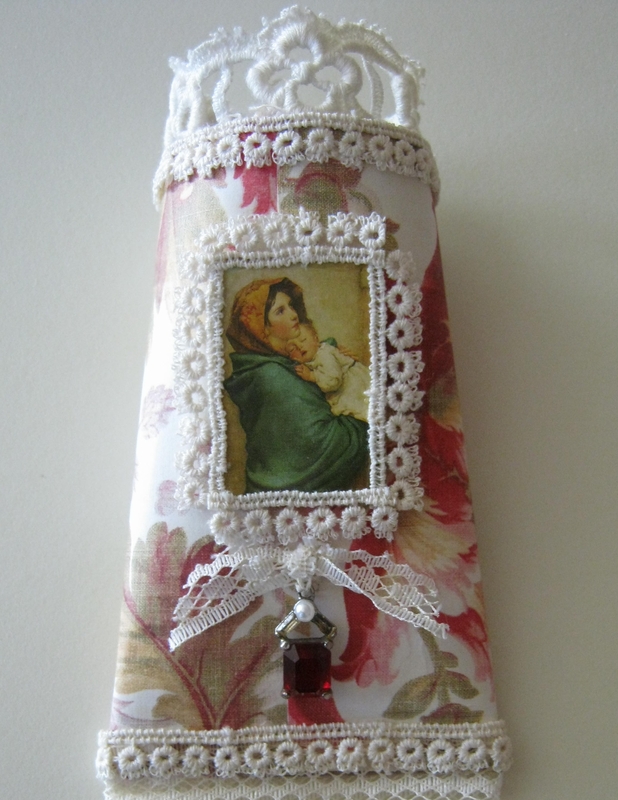 I loved the way the first Madonna and Child hanger came out so much that I just had to make another one because I really wanted to incorporate a vintage costume gem I had. 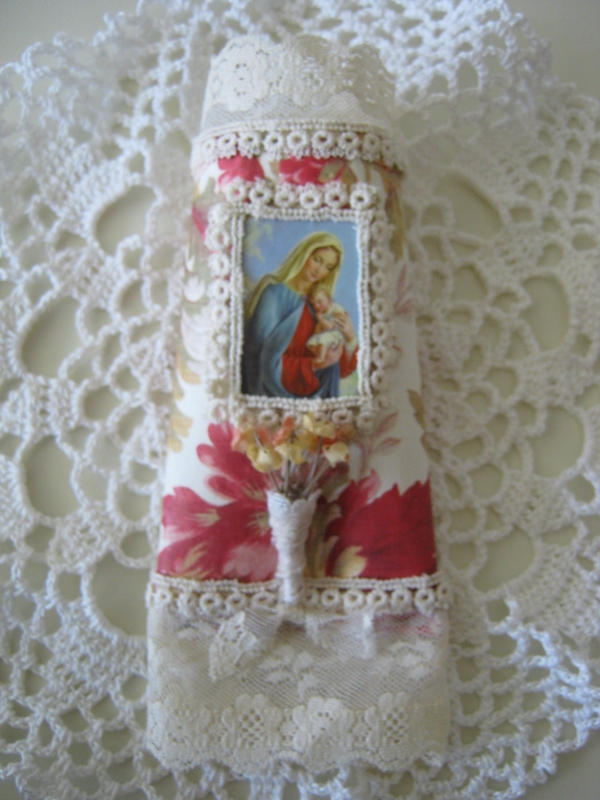 The gem dangles from a lace bow adding real charm to the framed holy images. I’ve always loved this painting and was glad it was part of the many beautiful paintings on the sticker sheets. Now all I need to do is add the hangers. I thought long and hard over my ribbon and lace stash, and I think I’m going to go with a satin style ivory colored ribbon to match. I apologize, folks, but The Empty Little Stocking may not be out in time for this Christmas season due to some glitches. I’ll keep you posted on this one. 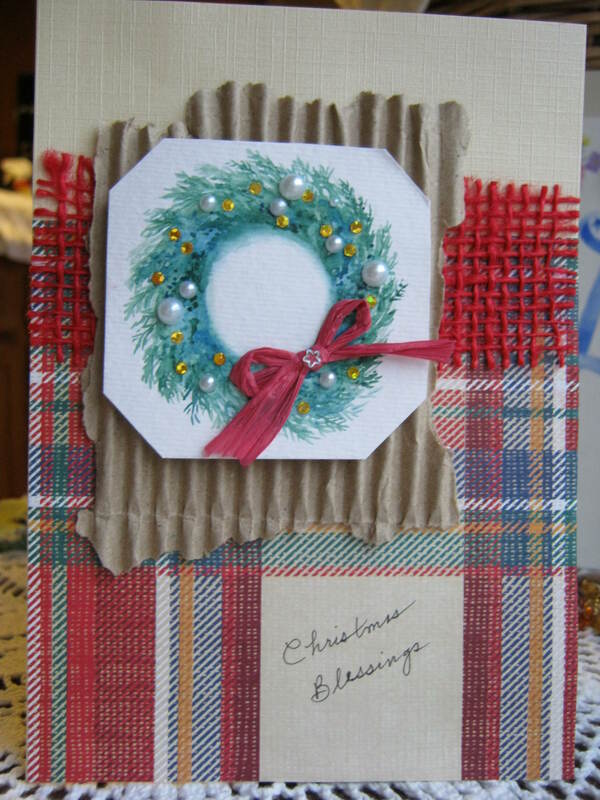 I’m joining Melody and friends for REDnesday, at Brown Gingham Creations. Today I managed to create another Christmas hanger, similar to the one in my previous post. 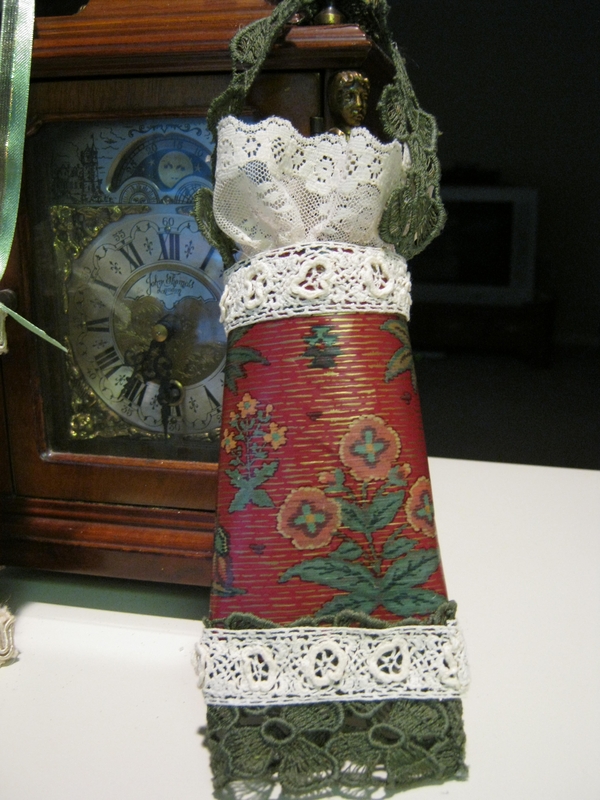 This time I used some beautiful wrapping paper and laces purchased at my local thrift store. 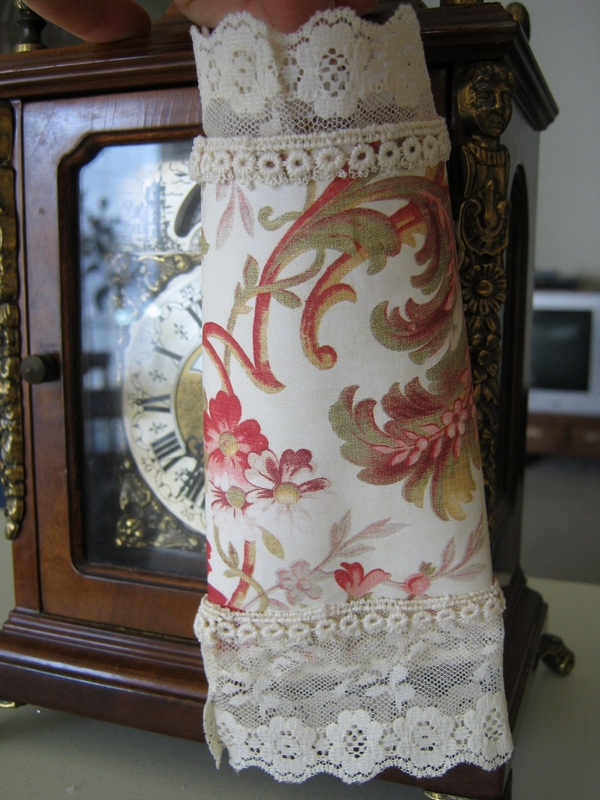 I’ve been frequenting the store picking up bags of wonderful laces and fabric remnants. Isn’t the green lace beautiful? The gold ribbon and star was actually given to me by a dear neighbor boy years ago…he’s no longer a boy, but just turned 16 this year. I’ve re-purposed it and will be giving this one to his mom. The photo of back really shows some of the gold in the paper. I’m having fun making these, and hope to be able to do a few more. I hope you enjoyed these, and they’ve inspired you. Joining Melody and friends for REDnesday at Brown Gingham Creations, and Beverly and friends for Pink Saturday at How Sweet the Sound. Come by and join the fun.